Mondo Arc magazine is the leading international magazine in architectural lighting design. Targeted specifically at the lighting specification market, mondo*arc offers insightful editorial on architectural, retail and commercial lighting. 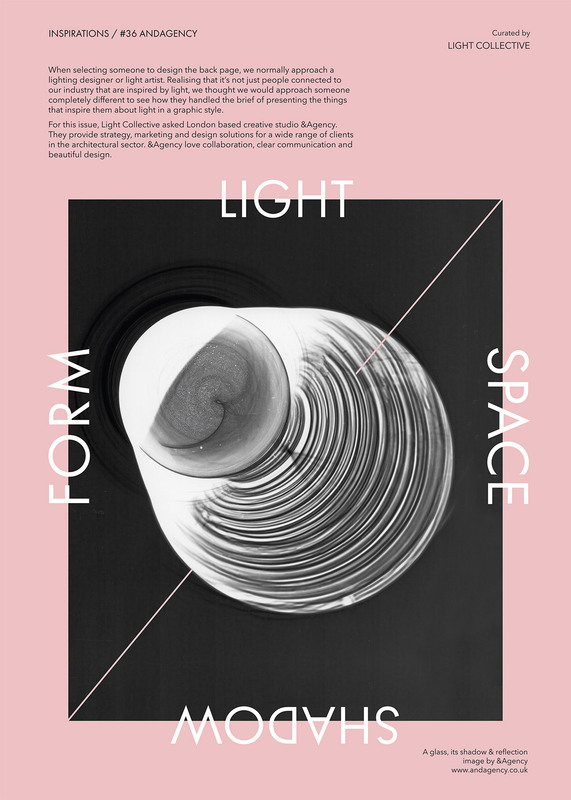 The Light Collective invited us to design the back page, part of Light Collective Curates. Normally they approach lighting designers or light artists but were interested to understand our take on how light inspires us as designer/artists. Our artwork explores the reoccurring themes within our work: Light, Shadow, Space and Form. The image shows an abstract shape of a glass with its shadow and silhouette captured simultaneously. And is part of a series of work by &Art Director Nina Farrell made entirely in the darkroom with light and chemicals.